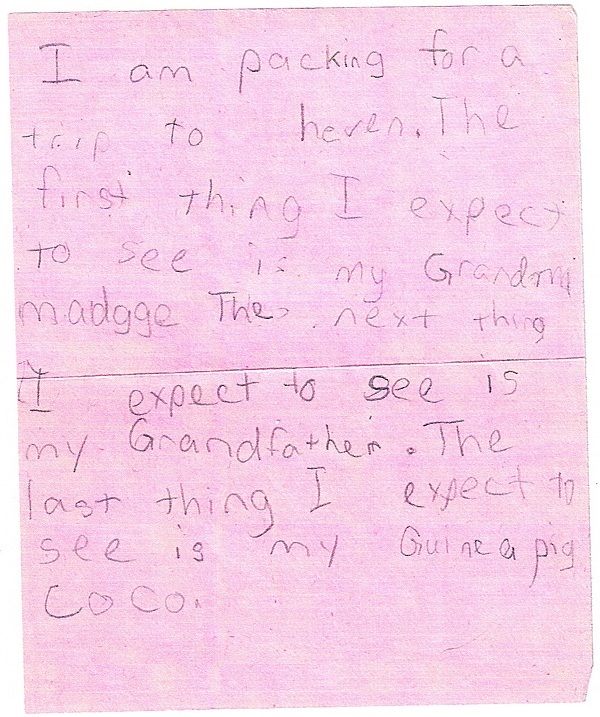 Note written by Michaela, 1988. Well, you talk about a study in contrasts, between my last blog and the one I am about to write. The last 24 years have been filled with leads of this sort or that. This may be no different from all the others. It may be a big story that causes those of us who are looking for Michaela to hold our breath, only to find out it’s nothing. Maybe. But maybe not. Last Monday I was called into the Hayward Police Department, where I met with our detective and a second detective, who had been working on the Shermantine/Herzog lead since it first came out last January. He gave me a short history of these two, known as the Speed Freak Killers. I’m pretty sure the story is familiar to most of my blog readers. One of their victims whose remains were identified through the information Shermantine provided to police this last year is JoAnn Hobson, who went missing from Stockton, California, in 1985 at the age of 16. JoAnn’s mother, Joan Shelley, had to fight to get her daughter’s remains released to her, but finally the San Joaquin County Sheriff’s Department delivered to her a box of bones. By this time she was mistrustful and suspicious of the Sheriff because of the way her daughter’s case had been handled, so she sent the remains they’d given her to the Human Identification Laboratory at Chico State University. It turned out her suspicions were correct, as not all of the bones she’d been given belonged to her daughter. One of the bones was from a child, between the ages of 5 and 13. Herzog had been previously linked to Michaela’s case by his partner in crime, Wesley Shermantine, because he looked like Michaela’s kidnapper (although Shermantine later stated that he “doesn’t know anything about that Hayward girl”). The age range of the victim, combined with the limited period of time in which these bodies had been buried, also limits the possibilities as well. There are not that many missing girls from this area of the country that it could be. At any rate, the bone was turned over to the Hayward Police Department. They took it to a laboratory for DNA testing. The results were inconclusive, because the condition of the bone was such that they were not able to obtain a full DNA panel. I do understand that there were some matches to my DNA, but again, that does not provide an identification. So it has now been sent off for additional testing at a lab that specializes in extracting mitochondrial DNA, which is passed from mother to child. The results of this testing will tell us positively whether this bone is Michaela’s or not. It’s quite a leap to go from posting information to help Michaela find help in the UAE to saying in the next blog that I believe it’s likely that evidence has been found that Michaela is not alive, but yes, that is what I am going to say. Part of the reason I say this is because it is simply a logical conclusion. Part of it is that it just feels like it is. In my heart, I have been expecting something to happen. I didn’t know what. I didn’t know it would be this, but I was just expecting something. Waiting for the results of the DNA testing is not easy. My daughter Libby, talking about the possibility that we would find out Michaela is not alive, said she wouldn’t know how to live, because she had lived her whole life with Michaela being missing. I don’t know how to live right now, in this waiting time. If this is confirmed, though, I will be glad to know the truth, simply because it is the truth. And I feel an overwhelming desire to bring Michaela home. It breaks my heart to think of her little body lying in that godforsaken place for all these years, and if that is so, I want to gather her up and bring her home. Of course, that would be difficult. I’m not sure, but I’m guessing that a body that is at rest in a single location even more 24 years would be fairly much together. But that is not the case here, because the Sheriff of San Joaquin County seemed to think that the best way to excavate the well and dig out the remains was with a backhoe. I’ve been through searches before for possible sites of Michaela’s remains. Somewhere in this blog I wrote that I wanted to be there if Michaela was found, if for the first time the light of day touched her, that I wanted to be there, that if all that was left of her was skeletal remains that I wanted to wrap my arms around those little bones and hold my daughter. But no. In this case, there is a single piece of bone, three inches long, because some dumbass thought it would be a good idea to go in there with a backhoe, callously crushing and destroying the fragile remains of all these fragile little lives that were ended so senselessly and brutally. I am guessing it would be impossible to return all the remains to the families. And they have created a practically impossible task of identifying who they belong to, because instead of identifying one whole bone, they have to identify numerous fragments. Did they not understand what it is they were doing? Did they not understand that these are the precious children of mothers and fathers who have spent years of their lives missing them, searching for them, longing only to bring them home? It seems not, and apparently they still don’t, as the San Joaquin County Sheriff holds onto the evidence with an iron fist instead of allowing the FBI or other jurisdictions to come in and try to identify these remains. Think of it. If this precious mother had just taken the box of bones she was handed and had laid them to rest without question, we might never, ever have known if this is Michaela. Never. We might have gone the rest of our lives without knowing. This is just unacceptable. One other thing, in September I wrote a blog about a difficult day I was having. One of the people who commented on that blog was Michelle Loftis, JoAnn’s sister. She reassured me that I wasn’t alone, that there were others who understood and stood by me, that they’d never thought they’d get her sister back but that they had, and that she knew the answers I sought would be coming soon for me as well. I hadn’t known what she was talking about at the time. But now I do. Michelle, if you are reading this, thank you. And thank your mom. Well, it’s been a long week, and a long day, and probably tomorrow will be also, as this just hit the news today. I will write when I can, and if I get any news, I will update you here. Thank you, as always, for your love and your support, and for never forgetting Michaela. And to you, Michaela, wherever you are, I love you. I will hold you in my heart always, and I will hold you in my arms again I know, through all the lifetimes in all the worlds. Forever, and then some, I will always love you. Thanks, Anonymous. You have no choice but to walk the path you've been given, though. Thanks, and you are right. Whatever is the truth, I need to know it. Wishing and not knowing doesn't change a thing. Yes, many many kudos to Joan Shelley. Now there is a strong woman. Thanks. I feel as though Michaela has given me a number of clues and little messages all along. Of course, I also feel a little dense because I am unable to interpret their exact meaning. I won't stop trying to understand, though.Thanks Josh. I just felt very sad.Thanks, Michelle. Thank you, Anonymous. One of the things that has always haunted me is the vision of Michaela waiting for help that didn't come. But I know she knew we were trying.Glad your story had a happy ending. Ceara, your words really touched me … so much so that I wrote a whole blog about them. I know people have called me naive for striving for a happy ending as well. But please don't be crushed, either way. If Michaela is not alive, that does not mean she can never come home. It does not mean there cannot be a happy ending. It will just have to be a different kind of happy ending, in a different time and place. Keep holding onto love and hope.Thanks so much for standing with me. It means a lot. That's exactly true Racquel. Thank you. I will never stop writing, Anonymous. Yes, maybe we should have had an archeological team out digging the bones instead of a sheriff. I don't know if they have tested all the bone fragments. I am no expert on it, but my impression is that they have to try to match it against missing people. I also understand that they have generally not been getting identification through standard DNA testing but have had to do mitochondrial DNA testing. Perhaps they could extract the mitochondrial DNA from each of the bones, and run a computer check against the mitochondrial DNA of all the missing being considered? This DNA is passed from mother to child, and they obtain it by swabbing the mother's cheek, so as long as there is a living biological mother they should be able to check it.I have a feel this is hugely expensive, and just one more reason why I do not know why San Joaquin County would want to hang onto this responsibility. I am well aware of budgetary constrictions on local law enforcement. Hi Sharon,I was living in Pleasanton, CA when Michaela was kidnapped. I was 4 and I remember watching the news with my parents… We kept her “missing flier” on our cork board for years and years. We have long since left CA, but I'm pretty sure it's still on that board in my parent's house. I have been praying for Michaela to return home for as long as I can remember. Praying for you to find answers and if it is her, then to find peace. Goodness, I hope someone higher up can cover the tracks they missed. I, in no way, want others to have been victims, but if they were, their families deserve closure.